When I see a new patient, I find it shocking they’ve never had proper bloodwork or lab tests done. I’ll try my best not to go off on a rant, but it’s not hard to order the correct tests, and now I’m going to teach you what to ask your doctor to order. To begin, start with the “usual and customary labwork” including a complete blood count, complete chemistry profile, UA, and so on. In addition, have your doctor order a TSH, a Free T3, Free T4, CRP, r (reverse) T3, TPO antibodies, and anti-thyroglobulin antibodies. TPO antibodies are much more apt to be positive in Hashimoto’s thyroiditis, but it’s best to be thorough. Reverse T3 is a test that has been criticized as being “trendy”; thus ordered too much by up-to-date doctors. RT3 is a metabolite of the inactive form of thyroid hormone T4, which then plugs up the T3 receptor sites, thus blocking the active form of thyroid hormone (T3) to bind to its receptors and act as it should. More about this coming up. Conventional medicine doesn’t have safe treatments for any autoimmune disease. In fact, steroids and even more toxic drugs such as “biologics” are used to suppress the immune system. Only if you visit a Functional Medicine doctor will you learn about changing your diet and more which I’ll discuss below. If you have elevated TPO antibodies, as three recent patients have had, it means your thyroid gland is under attack. Often, the CRP is elevated, as well. If you don’t address this, the thyroid gland will continue to be under attack, and symptoms such as fatigue, sleep disruptions, and so on will continue until the thyroid gland is burnt to a crisp, metaphorically speaking. Since Hashimoto’s starts with leaky gut, you’ll need the correct leaky gut supplements and probiotics to reduce the antibodies. You’ll also need to change your diet dramatically. Research has shown positive results for the autoimmune diet, GAPS diet, and even Paleo diet. It is clear that there is gluten biomimicry—and likely IGG food allergies to things like milk, eggs, and more. Therefore, to get rid of “possible offenders” and achieve positive results (100% of the time if a patient is 100% compliant), I remove all “potentially offending foods” for the first two months, while the gut lining heals. What Do You Need to Eliminate for Two Months? Coffee and chocolate (often reintroduced in month two). Alternative sweeteners such as xylitol and mannitol with stevia being OK.
Food additives such as gums and emulsifiers. Poultry, meat, and fish; It should be grass-fed, organic, wild-caught, humanely raised. All vegetables other than nightshades and white potatoes; Sweet potatoes are fine. Cruciferous veggies are also fine as long as they are cooked and not eaten in excess. For cooking: Healthy, high-flash-point oils (avocado, coconut, palm) and animal fats such as ghee. For salads: Extra-virgin olive oil. The safest is from California; not imported. Small quantities of berries and fresh lemon/lime wedges. Condiments: Vinegar; restrict to apple cider vinegar for two months. Dried, “safe” herbs. Beverages: Bone broth, loose herbal tea (hot or iced), water and unsweetened sparkling waters. Tea: Herbal is best, but some mildly caffeinated brands (loose, organic; not teabag) are fine. You’ll get creative with this limited list. In fact, there are endless websites with recipes, as well as social media groups. Since diet is an integral part of my personal Crohn’s disease treatment, I find that social media groups are quite helpful; as I am not the world’s best cook, by any stretch! Now, let’s switch gears to something I’ll bet your doctor didn’t even think about; SIBO (small bowel intestinal overgrowth). Since gut motility decreases when someone is hypothyroid, constipation is a common symptom of Hashimoto’s disease. This decreased gut motility, as well as leaky gut, often leads to SIBO. It’s estimated that a minimum of 50% of those with Hashimoto’s have untreated SIBO. SIBO symptoms are often confused with those of other GI disorders. The most common symptoms are flatulence and bloating; especially right after eating. Other symptoms include abdominal discomfort, diarrhea, and constipation. Multiple food intolerances are common. Symptoms can be very mild and “blamed” on the hypothyroid state. Those with SIBO are more likely to have T4 to rT3 conversion issues. Next, let’s discuss the treatment of rT3 excess. In case you missed the importance of this syndrome (diagnosed by A4M standards as having a ratio of Free T3 to R T3 of greater than 1.06); it can make you appear to be clinically hypothyroid, while your doctor sees what he thinks are normal lab tests. In addition, it is considerably more common in those with SIBO and those who are hypothyroid. It is treated by using T3 only to free up receptor space. Cytomel is the synthetic drug that is T3 only, but I always prefer to use compounded bioidentical hormones. Many physicians are “just fine” with seeing a normal Free T4 and a sub-par Free T3; while they give the typical thyroid replacement—a synthetic drug, Levothyroxine (AKA Synthroid). However, if you don’t have a “high enough” Free T3 which is defined as being more than 2.9 pg/ml, you are clinically hypothyroid. For this reason, I recommend everyone use pink Himalayan sea salt (not regular sea salt as it might contain plastic). I also find the majority of individuals are woefully anti-oxidant deficient, and this supplement has everything, including the right thyroid minerals; other than minerals I often add to supplement regimens (such as magnesium threonate). Here is what you need to keep the thyroid functioning: Iodine and Selenium (the most studied mineral besides iodine when it comes to thyroid function). Zinc, Molybdenum, Boron, Copper, Chromium, Manganese, and the proper balance of Calcium and Magnesium are also necessary. A little-known fact is that selenium deficiency is one of the main reasons for clinical hypothyroidism. It’s a necessary cofactor in the production of T4 (thyroxine). It also converts T4 to the active T3. A total of 11 selenium-dependent enzymes have been identified as needed for thyroid function. If you take iodine without selenium, you can cause selenium deficiency. Conversely; if you take selenium without iodine, you can cause iodine deficiency. The current recommended dietary intake of Selenium in adults is between 55 and 75 mcg daily. Foods rich in Selenium are oysters, most types of meat, brazil nuts, sunflower seeds and mushrooms. Many individuals are under the impression too little iodine is the issue when it comes to autoimmune thyroid disease. However, our over-consumption of iodized salt is considerably more often the problem than the converse. Autoimmune hypothyroidism and thyroid antibodies are more common in iodine-replete demographic areas than in iodine-deficient areas in numerous clinical studies. A number of studies indicate that even mild or moderate iodine excess (median urinary iodine excretion of 220µg per 24 hours) is associated with a more frequent occurrence of hypothyroidism. Additional studies show that sole low-dose iodine supplementation may be associated with increased thyroid autoimmunity. However, the exact mechanism of these findings is not clear. Regardless, ditch the iodized salt shaker in exchange for a pink Himalayan salt shaker. High cortisol can also cause leaky gut. As a result, controlling stress is crucial. Toxins such as heavy metals, mold toxins or the infestation of dust mites that result from mold spores can cause leaky gut. It’s also important to get a good night’s sleep to keep inflammation down and brain function up. Balanced hormones (meaning “all of them”) will help in the control of all autoimmune disease. Supplements can mimic TNF-alpha inhibition, and while not studied as combination therapies, I feel that it’s worth trying curcumin, resveratrol, and PQQ. In addition, Vitamin D must be optimized. And lastly, low-dose naltrexone might be an effective tool to keep someone with Hashimoto Thyroid Disease in remission. Studies on LDN for Hashimoto’s are ongoing and look quite promising. For more details, refer to the blogs about Crohn’s disease and the blog about the natural treatment of Rheumatoid Arthritis. 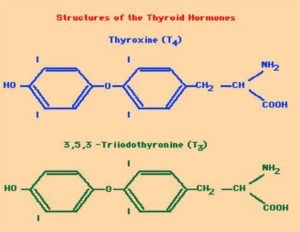 J Thyroid Res. 2018; 2018: 9610497. Endocrinol Diabetes Metab Case Rep. 2018; 2018: 17-0117. Low 25 Hydroxyvitamin D Levels are Independently Associated with Autoimmune Thyroiditis in a Cohort of Apparently Healthy Overweight and Obese Subjects. De Pergola G, Triggiani V, Bartolomeo N, Giagulli VA, Anelli M, Masiello M, Candita V, De Bellis D, Silvestris F.
Does Reverse Triiodothyronine Testing Have Clinical Utility? An Analysis of Practice Variation Based on Data from a National Reference Laboratory. Schmidt RL, LoPresti J, McDermott MT MD, Zick SM, Straseski JA. Hell J Nucl Med. 2017 Jan-Apr;20(1):51-56. doi: 10.1967/s002449910507. Epub 2017 Mar 20.